Sega have not only released a selection of screenshots for the recently revealed tarmac-burner Team Sonic Racing, featuring Tails, Knuckles, Shadow and Rouge, but they have also given out exclusive in-game footage to several media outlets. I have to say, it's not particularly impressive footage. 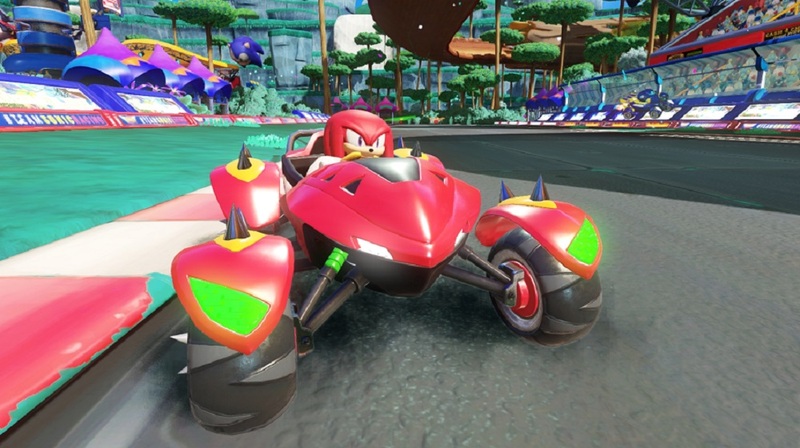 I'm a huge fan of 2012's Sonic & Sega All-Star Racing Transformed, so I'm looking forward to getting back behind the wheel with the spiky one. But, although the colours, characters and visuals are there, the game seems to be missing its mascot's one defining trait: Speed. The tracks clearly have the typical Kart Racer pickups, stunt-jumps and boost pads, all present and correct, but when racers aren't activating that stuff, things seem to sort of trundle along, particularly when cornering. That said, this is early footage, and maybe the full game will have different speed levels pertaining to tournament modes or difficulty. It's already a little disappointing that the cast is Sonic universe only, missing the many amusing Sega mascots from All-Star, as well as the fun transformation mechanic, so here's hoping that at least the racing is up to par, because this speed, combined with the obtrusive voices, is kind of pumping my hype brakes a little. Team Sonic Racing is in development for PS4, Xbox One, PC and Switch.